The Beaumont variation of the Adams revolver brought in a patented double action mechanism in February of 1856. This was a significant advantage over the competing Colt single action design and for a while the two designs competed head to head in Britain, vying for the British military and colonial trade. Chambered in 54 bore (i.e. .442 caliber) the revolvers made by Adams with the Beaumont patented double action mechanism were not only more convenient to fire, but also more powerful than the Colt of the time which was .36 caliber. 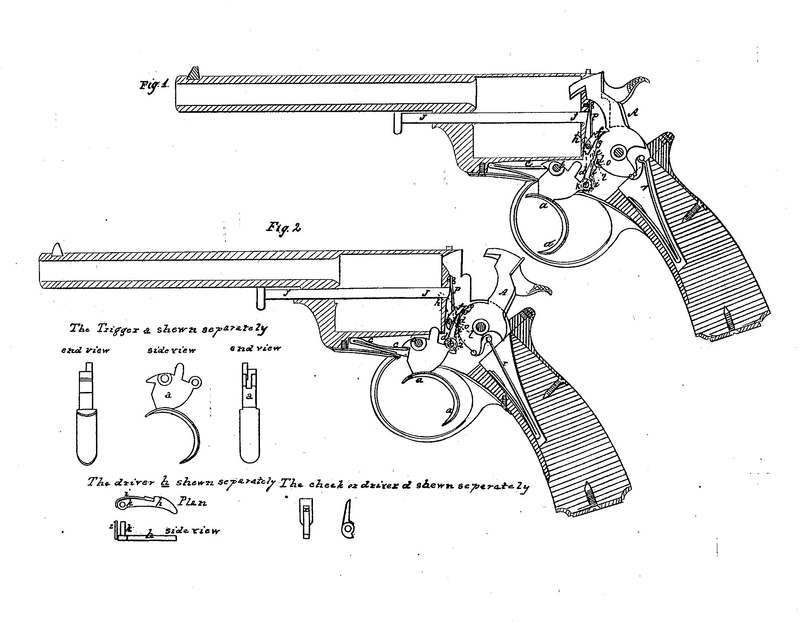 Patent drawings of the Beaumont double action mechanism for revolvers. (Picture courtesy Wikipedia). Lieutenant Frederick E.B. Beaumont of the Royal Engineers improvement to the Adams revolver gave it such an advantage over the competing Colt single action that the Beaumont Adams became the preferred revolver for officers serving in the Crimean war and was subsequently adopted by the British Military in 1856 and afterwards was also adopted by Holland and Russia. Such was the negative effect on sales of Colt revolvers that Samuel Colt closed his factory in Britain. This Beaumont Adams revolver was owned by Confederate General Confederate General Willliam Thompson Martin. (Picture courtesy Bonhams). With the Civil War approaching the Beaumont Adams revolver was purchased by officers of both the Union and Confederacy. Our feature revolver was purchased by Confederate General Confederate General Willliam Thompson Martin who purchased it via P. Bouron & Son of New Orleans, Louisiana. This revolver is coming up for auction at Bonhams Antique Arms & Armor and Modern Sporting Guns sale to be held on 13 Jun 2016, starting at 10:00 PDT in San Francisco. 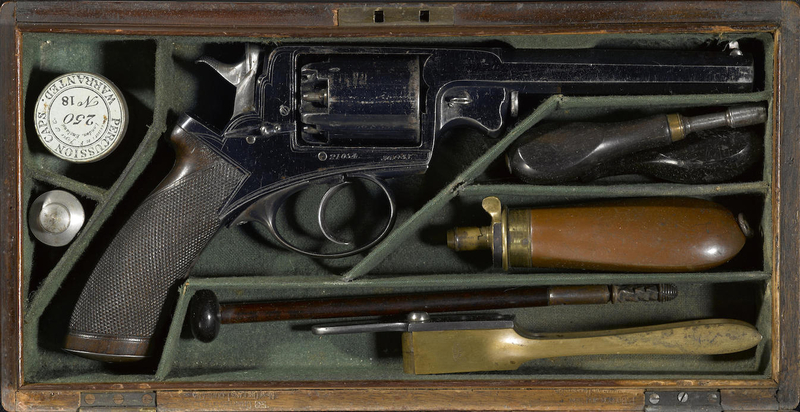 You will find the sale page for this beautiful cased and historic revolver if you click here. The Bonhams Antique Arms & Armor and Modern Sporting Guns has some very interesting revolvers coming up for sale including a cased and factory engraved Colt Model 1849 percussion pocket revolver and an engraved Colt Model 1851 Navy percussion revolver with shoulder stock in deluxe casing along with a large number of percussion revolvers by Tranter. One of the most numerous listings of Tranter revolvers I have ever seen. Just continue on from the linked page as there are a number of pages of Tranter revolvers on offer. The auction is coming up on Monday 13th June 2016 and is an excellent opportunity to acquire some unusual and valuable pieces. 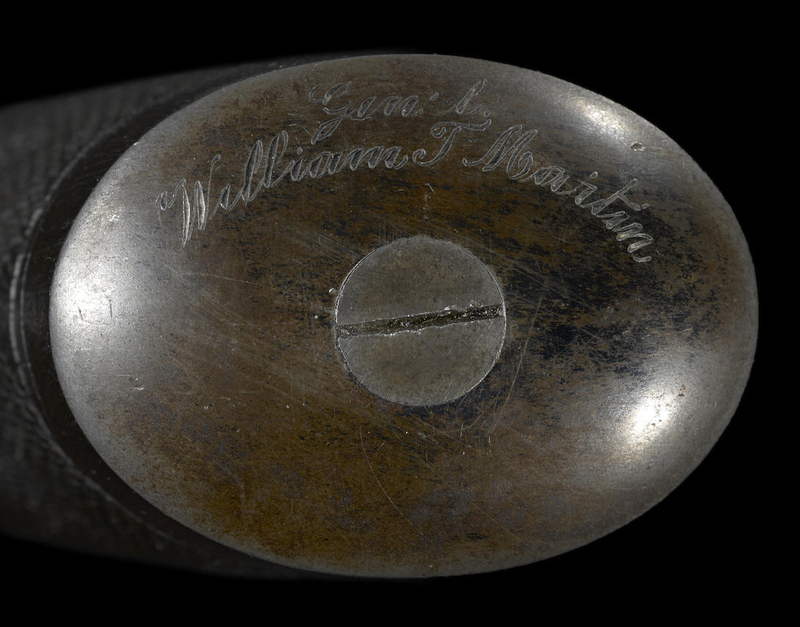 Confederate General Confederate General Willliam Thompson Martin’s inscription on the pistol grip cap of the Beaumont Adams revolver. (Picture courtesy Bonhams).